This year, I got my first tattoo at the age of 27. Which is crazy, because I swore I’d get a tattoo the minute I turned 18. Instead, it took me 27 years to find a tattoo worth having. I’ve always stood directly on the fence, in the debate on tattoos. I understood/agreed with all of the reasons to NOT get a tattoo, yet I found ways around all of those reasons. But, I am a bit too practical to ever completely throw caution to the wind. So I decided that I would only get a tattoo if I found a tattoo that I needed. 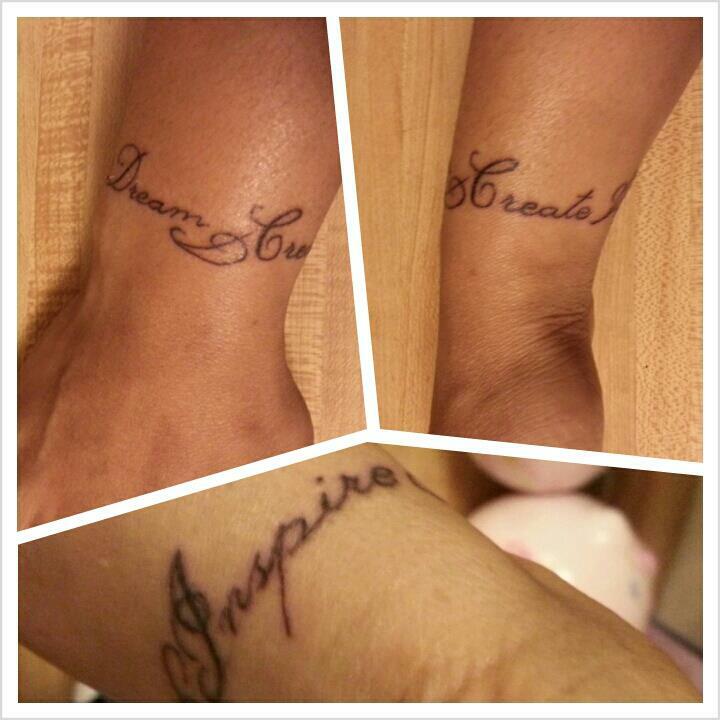 My tattoo wraps around my right wrist, and it reads “Dream / Create / Inspire”. It is both my encouragement to others, and my encouragement to myself. Mostly to myself. Because it’s pretty darn tough to read these words on my wrist every single day, and continue to ignore my calling. My calling is to dream. To create. And to inspire. My tattoo serves as my ever-present reminder to live up to my potential. I immediately recognized the pressure that my tattoo places on me. Stranger: What does your tattoo say? Me: It says Dream, Create, Inspire. Stranger: Oh, cool! What does it mean? Me: Well I’m a writer, so it’s an inspiration to me, to write. Stranger: That’s awesome! What’s the last thing you wrote? It became quickly evident that now, thanks to my new tattoo, I would have to write. No excuses. And it’s working! Since getting my tattoo, I’ve been more inspired, more focused and more productive. I’ve gone from telling people that “I want to be a writer”, to saying “I am a writer”. Because I am. A writer. Let’s Discuss: What non-traditional objects/items/people have inspired you in unexpected ways?